Fresh from our oven and impossible to resist! Mother's own recipe elevates this traditional favorite to new heights! Delectable, imported seedless raspberry jam spread on a superb hazelnut dough and baked to perfection! Perfect! 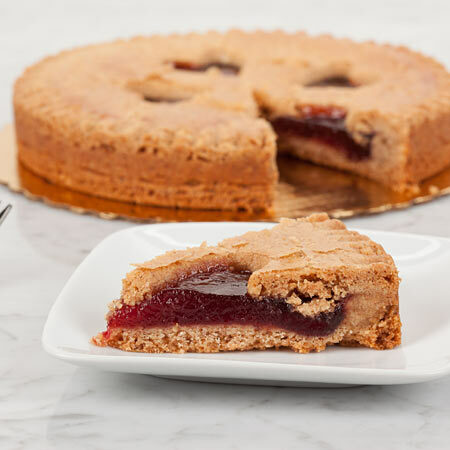 Linzer torte was part of my family's traditional Christmas morning growing up. I looked all over and had trouble finding anyone who makes it. I finally found this friendly bakery online the other day, and had them overnight one to Texas. Absolutely delicious, and extremely fresh. Thanks! We received a Mother Myrick's Linzer Torte for Christmas. My husband grew up with these from his German side of the family. We were desperately in need of one since it's a huge family Christmas tradition. This one was amazing! You could taste the cinnamon and the jam filling was the perfect amount. It was moist and delicious! Our only problem was that there was only one of them. I'm so happy to know where to buy more in the future!